pool | Master Pool Service, Inc.
Construction on this new pool began in December of 2014. Building pools over winter months tend to have delays due to the weather. But, now that’s it’s springtime, we were able to complete this lovely new addition to a new home with plenty of time to spare for optimal enjoyment. The vermiculite has been laid and is ready for the new liner. 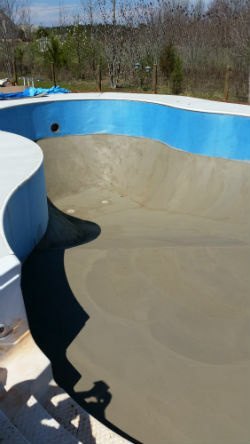 This pool features a 4 foot wide poured concrete deck that hugs the pool and provides stability to the sides. The liner is a 30 mil liner that is expected to last for 15 years with proper maintenance. The pool liner has been installed and the pool is ready to be filled. Don’t forget to let your local water authority know that you’ll be filling your pool. You can save on the cost that way. This pool was installed by Master Pool Service, Inc. in March of 2015. This entry was posted in Uncategorized and tagged chlorine pool, GA, Georgia, Henry County, open my pool, pool, pool advice, pool chemicals, Pool Guy, pool service on April 28, 2015 by OM.